This MP 15-22 has a Kryptek Highlander camo finish, chambered in 22 LR and has a 25 round magazine. Like S&W products, plus the Kryptek design on a nice .22. Good Reviews, Price was good and I like the camo pattern. Very fun to shoot and extremely accurate. Kids love it too. Looking for a less expensive alternative for practicing AR-15 platform shooting. Great Price and great company to do business with. Always fast with shipping. 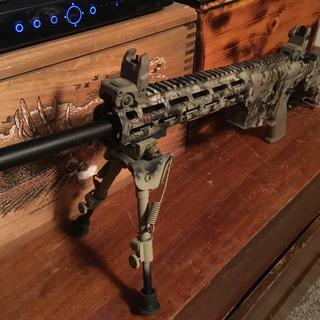 Great deal on a nice AR style .22, love the camo! I love this gun. I have had a few issues with it cycling cheap bulk ammo though. If I run quality ammo thru it, I have no issues. Great gun for plinking and training, can't go wrong with Smith and Wesson. Excellent quality and low price. I don't know how you beat this deal. Excellent firearm at a great price. What caught my eye qas the Kryptic camo. After being broken in and loading the mags properly, this thing is just plain fun to shoot! Thanks grab a gun! No complaints to grab a gun. Gun shoots very accurately out of the box. There wasnt any instructions on loading the magazines and if you load them improperly they will fail to feed quite often. After 1000 rounds through the gun now and loading the mags properly I avg maybe 1 out of 100 rounds fails to feed. I blame mostly on the cheap ammo I'm shooting but with better ammo it hasnt failed to fed or eject. Cool looking and cheap to shoot. It gives that ar feel and motion without breaking the bank. Thanks to grab a gun again for a quick shipment and great customer service. Incredible gun, and with cci stingers, I wouldn't hesitate grabbing this as my choice for survival rifle over my 223 AR. I can carry over 2000 dead on accurate rounds all day without weighing me down. I have a Trijicon scope, and at 200 yards im at a 3 inch grouping all day. The gun is great but the magazines dont seem to want to load correctly. I love the gun and the camo. I bought this for my 8 year old son. We both just love this rifle. As always, GrabAGun shipped fast and was very pleased with rifle. Great little shooter and finding it to be very accurate . Would not hesitate in buying another for my grandson. Super fun to shoot! Any ammo runs smoothly through this machine! It's not picky and I like that! Gave this to my son for Christmas and shot 500 rounds through it the same day. it was a blast! This is by far one of my favorite guns I own. Only problem is my wife and I argue who gets it first so she has decided to buy the same exact model in Robin's egg blue. Outstanding service from grab a gun...fast shipping and for sure will be my next stop for any purchase...thank you! I shoot a variety of 22lr firearms and ammo and this is by far the best rifle to shoot with. It doesn't cycle the subsonic stuff but everything else it chews up! Great gun. I kybshot it once. Kryptek looks cool! I heard it’s a great gun and so far...it is. I love it I only ran about 300 rounds through it so far it shoot great it’s pretty accurate up to a hundred Yards ! I have the M&P Sport-II and this has been a good, cheaper platform to test out additions to my Sport-II before moving them across. Also was a good break-in point for my teaching my brother how to fire a rifle. First time buyer and it will not be the last. Customer Service (Landon) was great to work with. I was using AMEX Gift Cards and AMEX CC, I was told no problem just call, great business transaction. 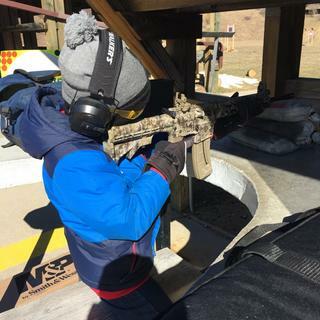 In 7 days I had the weapon and at the range. It was shipped out the next day. Wow. Everyone at the gun store loved the camo. Fun shooting, no flaws. GREAT PRICE!!! 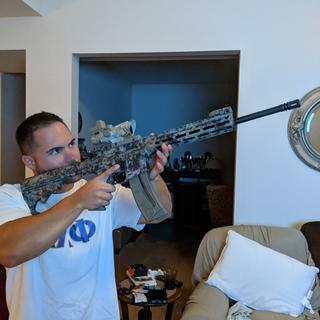 Being this was my first order and reading other reviews I was a little hesitant but could not find this riffle with this finish anywhere for a better price and decided to give the service a try. Honestly, so very glad I did as from checkout to my FFL it was only 5 days. Grab a gun kept me posted on all shipping updates and was exactly as described. The riffle itself is hands down a complete blast to shoot and have put a little over 100 rounds through it with zero issues. I am looking to make a second purchase with this company as the entire process was flawless and even called customer service before ordering with a couple questions which were answered completely with true knowledge and professionalism. If you are looking for a great .22 that is fun to shoot with a company that is outstanding you have come to the right place...like Nike says - just do it! !